Get natural, matte finish look with NYX Hydra Touch Powder Foundation!!! Comes in a classy compact packaging! The mirror is of good size!! The sponge is soft and does its job well! NYX Hydra Touch Powder Foundation comes in an elegant black compact with all the details written over the black outer packaging. It feels very light and I love carrying it in my bag (may be if I need touch ups!). It has got 2 compartments- one for carrying the foundation and the other for the sponge. There is also a mirror which is pretty useful whilst traveling. I got 2 shades- Porcelain and Caramel. 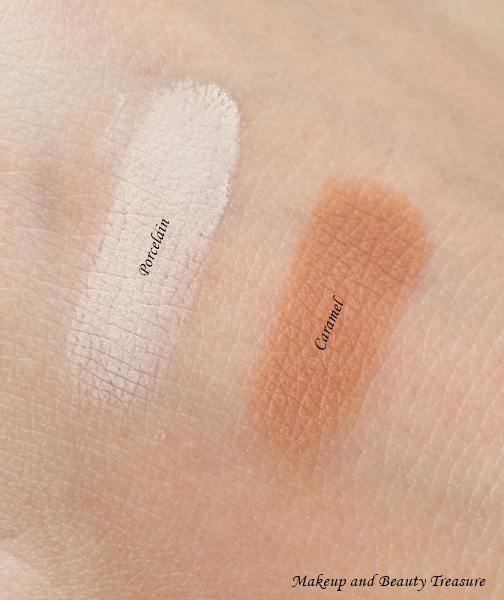 At first, I was skeptical to try both the shades as one looked pretty light whereas the other very dark but luckily both the shades worked for me. Porcelain is basically a yellow toned powder foundation that matches my skin tone perfectly. You can apply the powder foundation either using the sponge provided or the kabuki or powder brush. I tried both ways and the results were pretty same. Always remember before applying any kind of powder makeup, make sure you have a nice, moisturized skin else it might look dry or flake-y on the skin. I lightly sweep the sponge over the foundation and pat it on my face. It gives a nice, matte finish to the skin. It is indeed weightless and feels as if I have nothing on my face. I did trekking using this foundation and my face still looked fresh yet matte. Using the kabuki brush, I simply swirl it over foundation and apply it on face using downwards strokes. The foundation has medium to build-able coverage and hides redness or minor blemishes off the skin. It makes skin look more even and smooth. Caramel is way too dark for my skin tone but it works perfectly for contouring. It is very pigmented so less is more with this product. It has matte finish and looks absolutely natural on my skin. - Packaging. It is very light and comes with a sponge and mirror! - Lightweight. I do not feel I have makeup on! - Blends like a dream and gives natural look! - Can be layered for more coverage. - Does not feel flake-y or cake-y. - Dry skinned people make sure you moisturize your skin really well else it might highlight dry patches! - Coverage is not enough to conceal pimple and acne but no worries you can always use a concealer. NYX Hydra Touch Powder Foundation is a good coverage foundation that feels light and natural on skin. It gives matte finish and skin feels fresh for the longest time. I would definitely recommend it to people with oily, combination and normal skin! - Always apply a good moisturizer prior to foundation application. - Less is more with powder foundations. - Wash the sponge regularly. - For more coverage, apply a liquid foundation and then powder foundation as setting powder. Will you try NYX Hydra Touch Powder Foundation? I wish there were all shades available in India too! The 2 shades i got are also not available online! Yeah Nats its very expensive! Megha the Nyx Hydra Touch Foundation looks pretty good.I loved the packaging of this foundation.I have never tried powder foundations and this one looks like a nice one.I will definitely try it out Nicely reviewed. I have dry to combination skin. So this might not be for me.. Yes you should not go for matte finish! Expensive as hell! I really wish drugstore brands launch more shades in India. i agree its too expensive! Its better to ask someone to get from US! The packaging is great and so seems the quality but at this price and with the limited shade availability, I guess its better to find options similar to this one.. I agree dear. Price is pretty high! I have oily combi skin so it works like a charm on my skin! I have oily skin and I love NYX cosmetics. First I moisturize with Roc. Then I use Stay Matte Not Flat liquid foundation. Finally, I apply the powder foundation to build even more coverage. I was using Matte Not Flat powder, but I switched to this compact by accident. It was a great mistake. Matte was good but a little too drying. My skin felt great all day with Hydra Touch, and my makeup lasted all day. Disclaimer, I use L'Oreal's setting spray for longer-lasting coverage (13+ hours). L'Oreal is great, but the make up has to be a good quality for it to do the job right. NYX is a great product for the money. i so agree with you! Quality makeup makes a difference! Thanx for sharing your makeup routine. i would to try the products you recommended! On my oily skin about 4-5 hours!